A couple of months back someone asked to do a post on how I organize my studio. Here is a peek at some of my favorite items that help keep my studio tidy, organized and efficient. I have a lot of brushes and being able to quickly find the one I need is important to me. I use these little bamboo containers from Blick for my brushes. I molded clay into the small bamboo chamber on the underside, let the clay dry and then glued it back into the depression. This counterweight keeps the containers from tipping over and damaging the brushes. I use the Studio Designs Futura Craft Station with a Glass top to store all of the things I use most regularly during my painting sessions. There are little divided trays on each side that hold pencils, erasers, tubes of paint and my tube wringer. 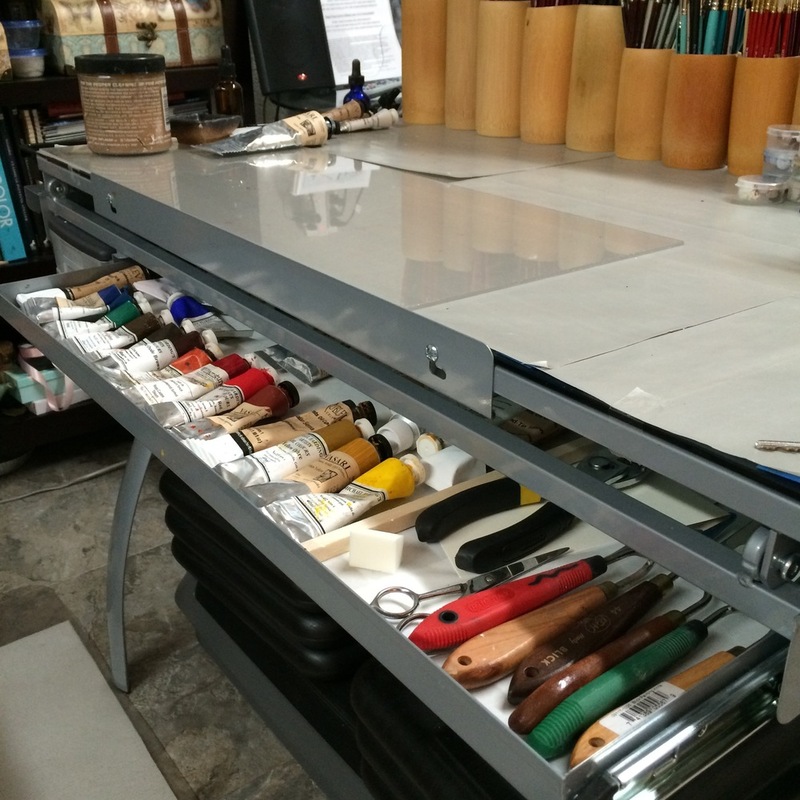 The drawer is the perfect height to store individual tubes of paint, palette knives, and other little necessities. That drawer contains only the tubes I use on a daily basis as my core palette of colors and in the order in which I place them on my palette. That way I'm never wasting time searching for a color I need. To keep visual clutter down I cover the top with neutral gray palette paper. Several years ago I built this little shelf for storing and organizing my tubes of paint. I store them with the caps down as I tend to favor hand made paint without stabilizers and other additives. Over time some of the oil naturally separates from the pigments and storing them in this manner helps keep the oil in the tube. I can quickly and easily find any color I'm looking for with this shelf for my paint. I get these modular storage squares from Michaels. They are wonderfully versatile and can be stacked in any configuration. With all the differently shaped cubbies and drawers it is easy to keep clutter in check and supplies easy to find.